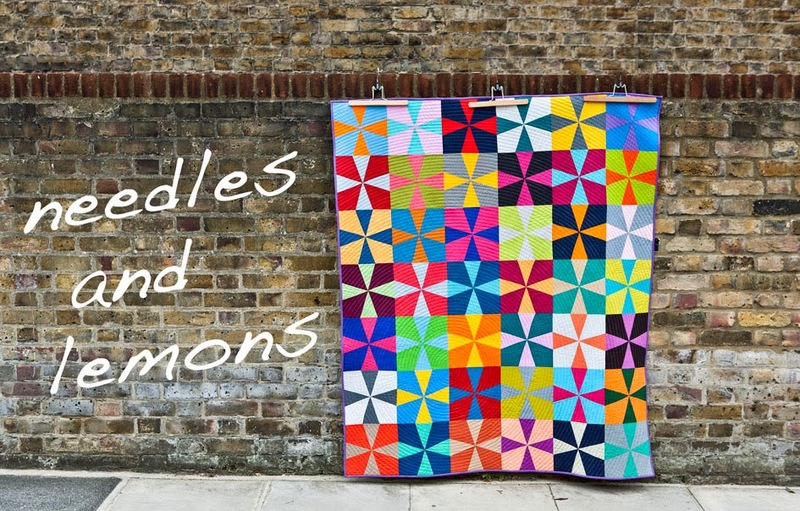 So here it is the finished 'Laugh and Happiness quilt'. I finally finished it yesterday evening. And guess what ? Finally I am also really happy with it. I quilted it in one continuous circle starting in the centre. 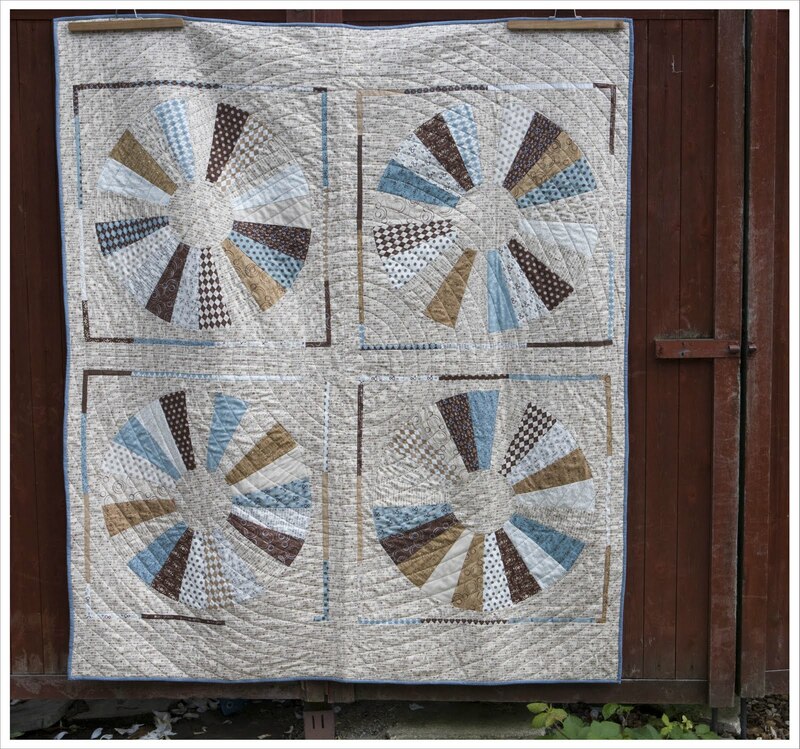 I was a bit apprensive about it at first as I have never done this before but really it was a breeze and it gives another dimension to the quilt. All I need now is my mother to love it (but if that doesn't happen I think I'd be quite happy to keep it after all :-) ). 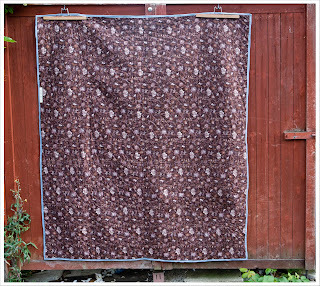 For the back I chose a print from Fabric Freedom in London called 'Chocolat'. 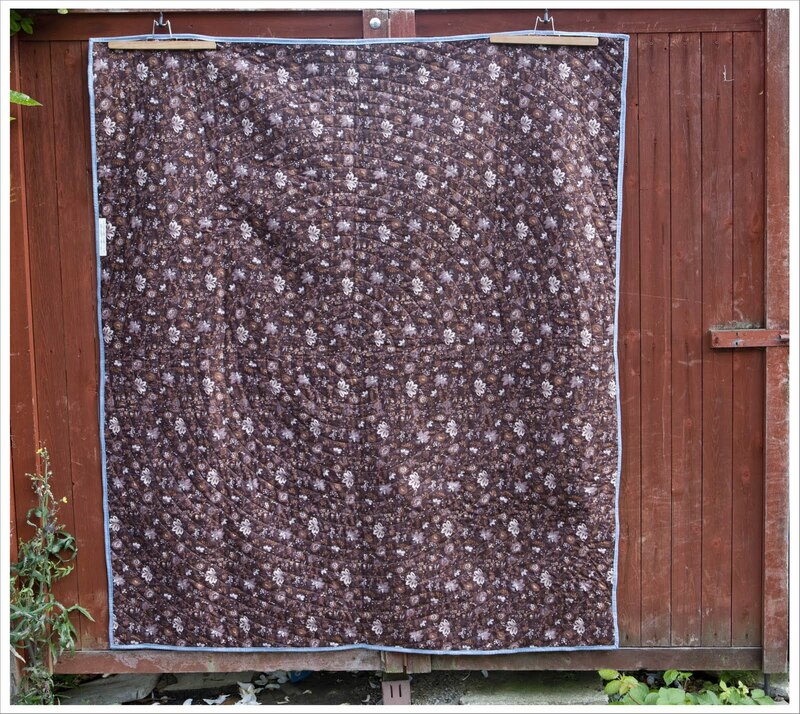 It is a beautiful dark, rich chocolaty colour with a floral print. It wouldn't have been my first choice but again I chose with my mother in mind. 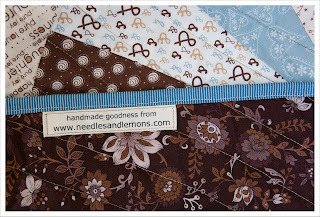 The binding is from the 'Punctuation Collection' from American Jane for Moda. Both, back and binding fabric are from my local quilt store. 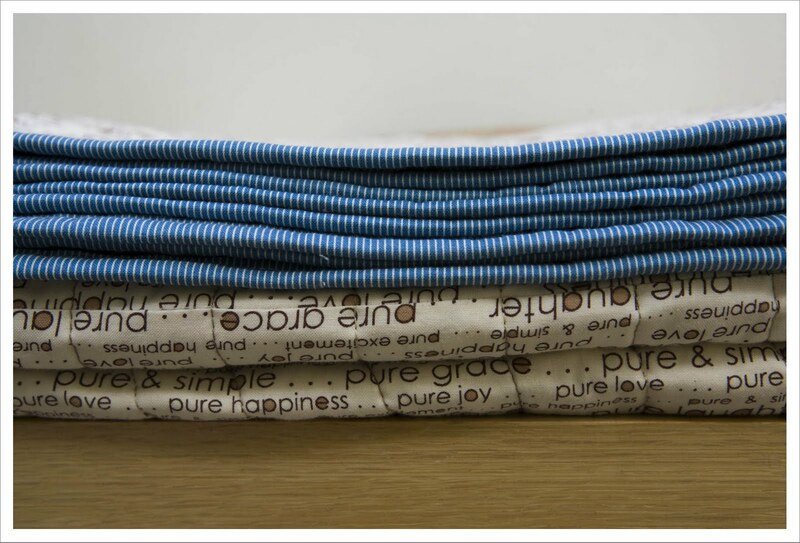 The binding is a lovely blue pinstripe cotton that contrast well with the top and back. I wanted something that wasn't earthy or brown but would fit well in the overall colour scheme. 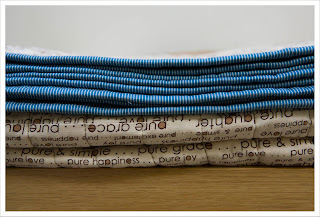 Fabric for the top: Pure Sweetwater from Moda (bought online as a layer cake in the US but can't remember the shop). Other entries regarding this quilt can be found here and here and here. Beautiful quilting, suits the quilt perfectly. 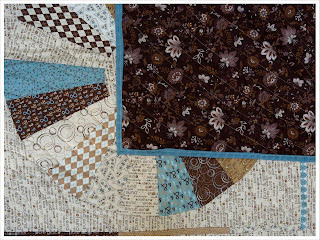 The quilting is incredible and creates a real feeling of movement. Your mother will love it or you get to keep it. Win win. Dresden goodness!! You did an excellent job! Beautiful quilt and that quilting is fantastic!! It has turned out so well!! Your mum would be crazy not to love it! It looks fantastic! I really like the way you've quilted it. Your Mum is a very lucky lady! 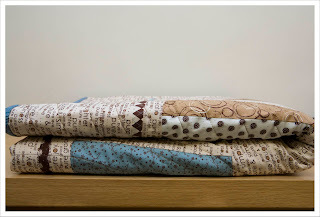 I love the quilting - it really adds to your quilt as does the tiny sashing you have put around the blocks! The colours are chic and make me think of Kaffee und Kuechen! Don't know why? what a great quilt, i especially love the quilting, it´s wonderful!! 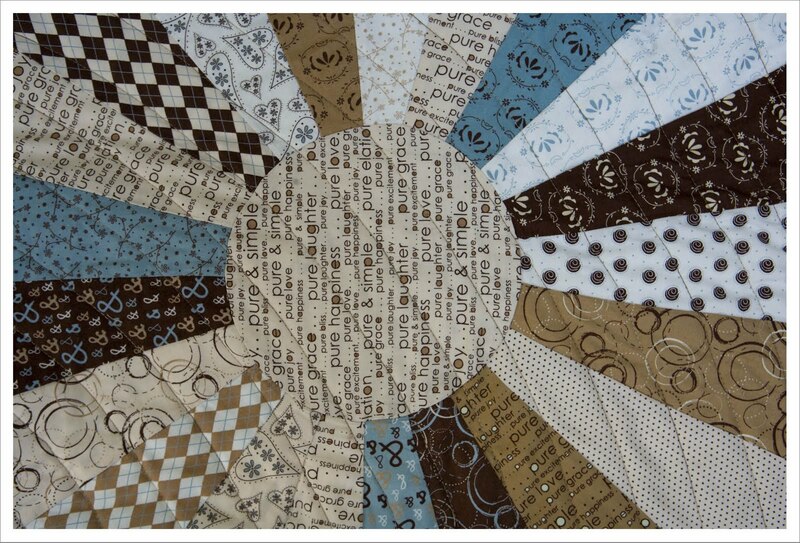 The quilting is brilliant, really gives it a different look. I'm sure your mum will love it, who wouldn't?! It is so wonderful! 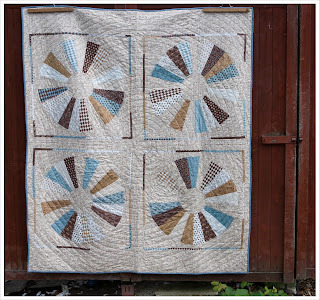 The huge circle quilting is brilliant! Congratulations on finishing this one off! How could your mother not love it?! 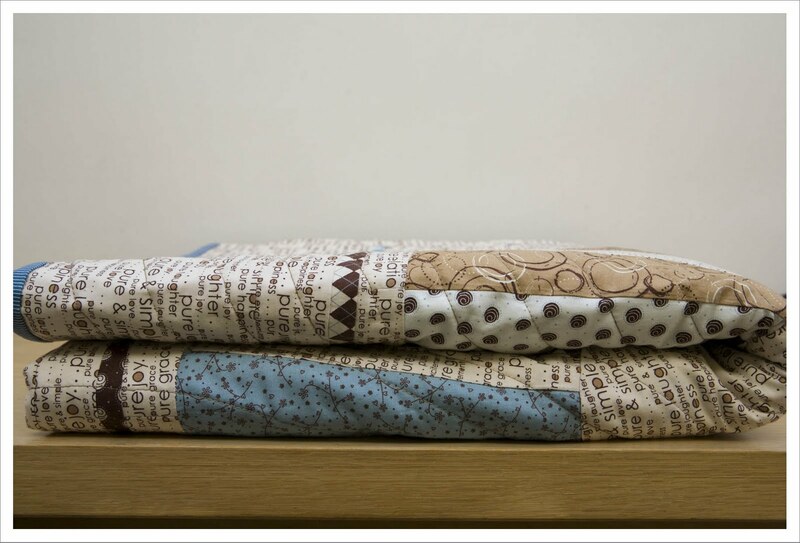 It is a winderful quilt and everything goes together so well - the fabrics, the quilting, the binding. One to be proud of! Lovi it - your mum will love it. May I ask where you got your labels from too, they are gorgeous. Your mother will love it. Nice quilt. It's lovely and pure makes it quite elegant, too.